Identities collide in this story of first love and first novels. 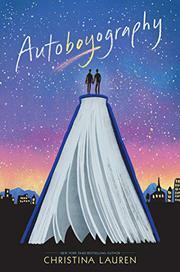 Eighteen-year-old white high school senior Tanner has always been at ease with his bisexuality. Comfortably out when he lived in Palo Alto, he moved back into the closet when his family relocated to Provo, Utah, for his mom’s work. As a “half-Jewish queer kid in a straight and Mormon town” he’s cautious about revealing his true self to his new community, planning to hold off being out until he moves away for college. This is easier said than done when Sebastian, a handsome 19-year-old BYU student–turned-novelist, joins their novel-writing seminar as the teaching assistant and Tanner falls head over heels. As their relationship moves from mentorship to friendship to romance, there’s much both boys must contend with. Sebastian’s devoutly Mormon (his father is a bishop), while Tanner’s not, and Sebastian’s unwilling to label his own sexuality. Moreover, Tanner’s manuscript is becoming increasingly autobiographical, risking outing them both. Given the issues involved, readers may be frustrated at the cursory attention given to Tanner’s father’s move away from practicing Judaism, and the representation of Mormonism, while not inaccurate, lacks the nuance the faith deserves. Additionally, an unexpected switch from first to third person near the end of the book leaves the rather meandering plot feeling clunky. However, readers will cheer for Tanner’s confidence in his sexual identity and for the quality bi representation he provides.